Quick question to refresh our minds: who was Prophet Muhammad(pbuh)? As Muslims, we believe he was the last and final messenger of the Creator to mankind. His life is an example for generations after generations until the end of time on how to live in a pure and humble way, with the worship of Allah the Creator as our purpose and pivotal role. Not only for our personal gain but out of love for our beloved Prophet(pbuh), we should try to live our life by the sunnah as much as possible. We should be active in learning about the life of the final messenger to mankind. While engaging in knowing about the life of a person, your love and respect for him grow. Similarly, when learning about the Prophet(pbuh), you will find hundreds of stories, attributes and habits that will be beneficial for your life if implemented, In sha Allah. 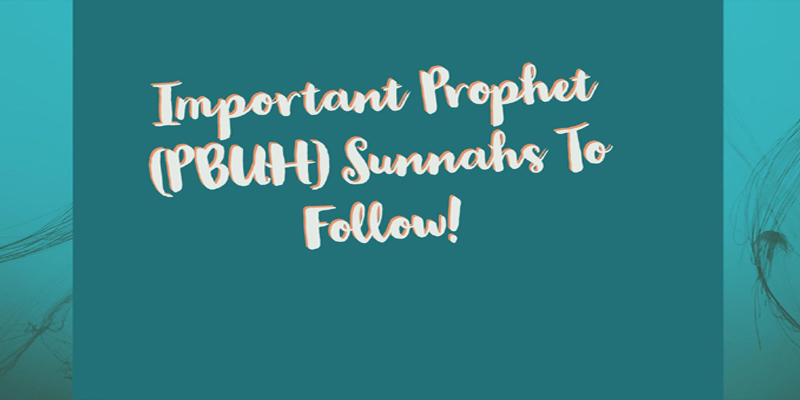 In this article, we will discuss 12 sunnahs of the Prophet that we must aim to revive, In sha Allah, in hopes of increasing our productivity, and seeking the company of the beloved Prophet in the Hereafter. Our sleeping pattern plays a great role in our ability to function effectively during the day. The hours after Fajr are among the most blessed of the day. Starting the day off by praying the morning salah sets you in the right frame of mind to be the best you can be throughout the day. However, in order to rise in the early hours it is imperative to sleep early as your body requires an adequate amount of rest. When you have a million things to do, it is easy to fall into a horrible cycle of sleeping late and waking up late. Due to our failure to wake up early, one day extends into the next in order to finish your list of tasks. Break that cycle today! Wake up early and sleep early to be the strong, successful you that you want to be, In sha Allah. Smiling has been shown to increase the natural antidepressant hormone, serotonin, causing the one who wears a smile to be happier. We underestimate the power of a smile on both ourselves and those around us. This characteristic is highly contagious and plays a massive role in building relationships with those around you. A positive mind and attitude is irreplaceable in the quest to be productive and achieve your goals in life. Smiling is a simple, inexpensive act that helps lift your mood and make you feel more grateful and content since our Prophet was seen frequently doing it. So, let’s follow along this great sunnah. Consciously take note of your usual facial expression: is your normal expression a happy one or do you always appear sad, exhausted, preoccupied or frustrated? It will take a bit of regular effort, but you can cut down on the frowning, smile more often and spread joy and peace around you as the Prophet instructed. This hadith indicates the view of the Prophet(pbuh)towards the siwak. Siwak comes from the Salvadora persica tree and has many anti-bacterial qualities, making it a great way to maintain hygiene of the mouth. It can be said, given how often the Prophet(pbuh) would have liked us to use the siwak, that there is a big emphasis on maintaining oral hygiene. It is narrated that the Prophet(pbuh) would use siwak upon waking. The teeth are delicate and when problems occur can cause tremendous amount of pain, so this sunnah introduces preventative measures against a problem that can have you rolled up in bed for days. Siwak is easily purchasable and relatively cheap, making it an easy sunnah to uphold. It keeps the mouth clean and fresh naturally and effortlessly all the time. The act of oiling is something many of us do not recognise to be a part of the sunnah. This hadith alludes to the idea of using oil to prevent grey hairs being visible, highlighting that the sunnah of the Prophet(pbuh) encompasses every aspect of life. Oiling hair on a regular basis prevent hair loss and greying, promotes strong and lustrous hair by strengthening hair protein and rejuvenates and relaxes the mind by soothing the brain’s nerves and capillaries. We seek all this by spending a great deal of money at hairdressers and spas, yet this simple sunnah can save us a great deal of money, time and effort whilst we continue to live like our beloved Prophet(pbuh). It is an underestimated fact that food has a dramatic effect on your body’s and brain’s performance. This hadith clearly highlights that overeating is a reprehensible quality we should stay away from. However, it is also important to remember that undereating is equally as harmful to a person. In order to function, we need to have a balanced outlook towards our meals; your level of food consumption should not leave you feeling tired or bloated as this is a state that leads to laziness, which is a vice we seek refuge in Allah from. Can you conquer the world by sleeping? No. So, eat a nutritious, balanced meal that is sufficient in suppressing your hunger. We often find ourselves in situations where we sit and talk about things that do not concern us. We waste precious minutes, even hours, just by talking about matters that will not increase us in knowledge, character or anything for that matter. When speaking ill of a person or situation, the conversation becomes elongated, sadly due to the desire to gossip. The beauty of this particular sunnah is that it will help you save time and reduce the amount of energy used to contemplate over irrelevant matters being discussed. This energy and time could be well spent on something beneficial, such as reading Qur’an or doing vital tasks, or only speaking things that benefit oneself and others in dunya and akhirah. The Prophet(pbuh) would be cupped on a regular basis. This form of treatment has been used throughout history in a number of countries. The benefits of cupping are vast, including the removal of toxins within the blood. Studies have shown cupping to be beneficial in the treatment of migraines, fertility and joint pains. This can be taken as a therapeutic measure against stress, helping to relieve a person of thoughts that impinge on their ability to complete their daily tasks. The concept of looking out for others is found throughout the teachings of the Prophet(pbuh). Sadly, we are regularly aware of people within our circle of acquaintances who are tested with an illness, big or small. Visiting and spending time with them has two major benefits. You demonstrate love towards another, instantly tightening the bonds of kinship/friendship. Also, to see someone who is unable to function as well as they normally can, is a strong reminder to us all of the blessing of health that we currently have and take for granted. The next time you hear of someone who is ill, try your best to go beyond sending them a ‘get well soon’ and practice a forgotten sunnah: make the effort to be physically present and comfort them. Those who stand to eat or drink always look like they are in a rush. Sitting down to eat slows a person in their eating habits, reducing the amount they are likely to eat and the unhealthy speed by which they do so. As mentioned above, eating consciously prevents a person from becoming fatigued due to their stomach size. Importantly, eating together as a family, which requires you to sit, is a crucial way to build relationships. One of the main points to consider when a person wants to have a productive, blessed day is to look at how you go to sleep. The Prophet(pbuh) was the most successful in how he spent his days; the way in which he took to his sleep plays a role in helping him to be like this. Following in his footsteps is the key to unlocking a fruitful morning. None of us want shaytan to enter our homes; we are aware of the distractions he creates to lead to our destruction. That being said, it is fundamentally important to seek refuge from his evil ways. Upon entering our homes, it is crucial to utter the Name of Allah to prevent our doors being open for him. shaytan is an enemy of productivity and success; his ultimate goal is to see us fail in our journey to develop a relationship with Allah. Take the measures, as given in the sunnah, against him because he will squeeze into whatever gap visible to him. Never let the enemy win! Waking up for Fajr is a battle many of us have experienced or are experiencing. The hours of the morning, as mentioned above, are a blessed time for being productive in studying and completing various tasks. The sad reality is, many of us miss out on this because we fail to wake up for Fajr on time. This hadith sets out the plan of action to be successful: wake up, praise Allah, perform wudu and pray fajr. Being lively and in good spirits are the perfect ingredients to having a productive day, and this is what you will achieve when you follow this sunnah, In sha Allah. How blessed are we that our religion teaches us about all the ingredients of a successful life? Alhamdulillah!